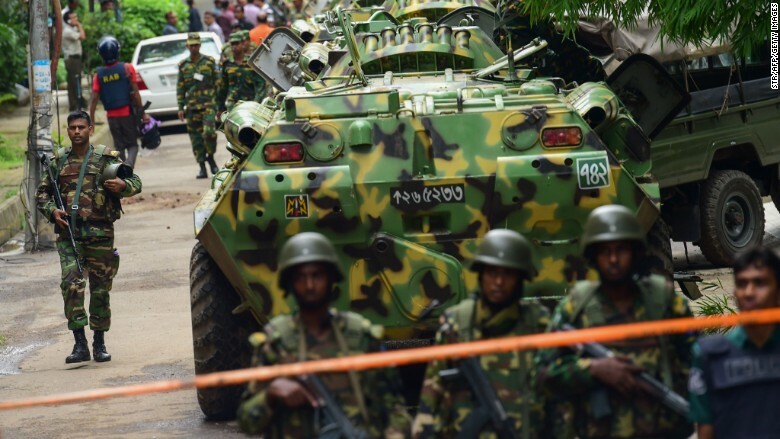 Members of the Bangladeshi military near the site of a terror attack in Dhaka. One of the poorest countries in Asia is also a global leader in a very specialized trade: Check the label on your t-shirt and there's a good chance it says "Made in Bangladesh." This weekend, the country's largest export industry was thrown into disarray after terrorists brutally murdered 20 people, nearly all of them foreigners, during an 11-hour siege of a trendy restaurant in Dhaka's diplomatic quarter. The country's garment producers are now racing to reassure major foreign fashion brands, mostly based in North America and Europe, that contracts will be honored and employees in Bangladesh will be protected. "There will obviously be an impact," said Faruque Hassan, senior vice president of the Bangladesh Garment Manufacturers and Exporters Association. "But we are dependent on these brands, and we must overcome this situation." Foreign buyers are already reacting. In Japan, which lost nine of its citizens in the attack, Uniqlo owner Fast Retailing (FRCOF) has announced a suspension of all "unnecessary" business travel to Bangladesh. The company has 10 Japanese employees in the country. H&M (HNNMY) said it has safety procedures in place for staff in Bangladesh, and it has also recommended that employees avoid unnecessary travel to the country. Puma said it would continue to source products from Bangladesh, and was not restricting staff travel. "However, we will decide [travel] on a case by case basis, depending on how the situation is evolving," the company said. Hassan, who makes clothes for brands including U.S. Polo, Benetton and Marks & Spencer (MAKSY), said the garment association was organizing meetings with buyers to take place when Ramadan ends later this week. Bangladesh has been a major beneficiary of a global search for cheaper clothes. In recent years, as wages boomed in traditional manufacturing hubs like China, more and more production has shifted to frontier markets such as Vietnam and Bangladesh. The garment industry now makes up more than 80% of Bangladesh's total exports. While it employs millions, the industry has come under intense pressure over working conditions and pay. In 2013, watchdog groups called for urgent action after more than 1,100 people were killed when a garment factory collapsed near Dhaka. Now, the industry is confronted with a violent, external threat. The government of Bangladesh insists that ISIS does not have a presence in the country, but the terror group has claimed responsibility for the attack. The group's media arm has released photographs of the attackers, smiling and holding their guns, clearly taken before the assault -- suggesting at least coordination with ISIS in Iraq or Syria. Hassan said garment makers can help foreign clients understand that the attack is not an everyday situation. "Buyers might be worried to come to Bangladesh," Hassan said. "But many of these brands have been coming to Bangladesh for many years, and they know how welcoming the country has been." -- Tim Lister, Yoko Wakatsuki and Stephanie Halasz contributed reporting.